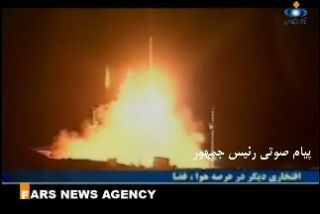 WASHINGTON - Iran?slaunch of a satellite into orbit last week will likely give U.S. and Europeanleaders greater cause for concern that the Islamic republic is approaching theability to field long-range ballistic missiles while its nuclear programcontinues to progress, analysts here agreed. The Iraniangovernment-sponsored Islamic Republic News Agency reported Feb. 3 that Iran hadlauncheda research satellite called Omid into orbit aboard a Safir-2 rocket. Thisis Iran?s first domestically produced satellite to reach orbit and the first tosuccessfully launch on an Iranian-built launch vehicle, according to Press TV,an Iranian government-sponsored news outlet. The U.S.government, while not explicitly confirming Iran has launched a satellite, hasexpressed concern that Iran?s development of a space launch vehicle establishesthe technical basis to develop long-range ballistic missile systems. ?Iran?songoing efforts to develop its missile delivery capabilities remain a matter ofdeep concern,? U.S. State Department spokesman Robert Wood said in a Feb. 3statement. ?Many of the technological building blocks involved in [space launchvehicles] are the same as those required to develop long-range ballisticmissiles. ? We will continue with our friends and allies in the region toaddress the threats posed by Iran, including those related to its missile andnuclear programs and its support of terrorism.? Satellitewatchers using orbital data provided from U.S. Strategic Command?s spacesurveillance network said the satellite is in an elliptical orbit that rangesfrom 242 kilometers to 382 kilometers in altitude, at an inclination of 55degrees relative to the equator. Ted Molczan, an amateur satellite observer,said the satellite and part of the rocket that took it to space are bothcataloged by Strategic Command and in similar orbits. The satellite appears tobe tumbling, as its brightness in the sky changes rapidly, indicating thesatellite?s likely lack of a stabilization or attitude control system. Both thesatellite and rocket body are likely to begin to deorbit this summer, Molczansaid. ?Dearpeople of Iran, your children have sent Iran?s first domestic satellite intoorbit,? Iranian President Mahmoud Ahmadinejad told Press TV. ?May this be astep toward justice and peace. Iran?s official presence in space has been addedto the pages of history.? Meanwhile,Iran continues to develop its nuclear program, which it says it has the rightto develop for peaceful civil uses as a signatory of the NuclearNon-proliferation Treaty. Iran argues it needs nuclear power and will not usethe technology to make weapons. The United Nations Security Council, whichincludes permanent members China, Russia, France, the United Kingdom and theUnited States, has urged Iran to suspend the program numerous times to noavail. ?This[Iranian satellite launch] I think highlights the dual-use issue again, just asthe nuclear issue does, and that is technology can be used for peacefulpurposes or for weapons that canthreaten other countries,? said Ted Carpenter, vice president for defenseand foreign policy studies at the Cato Institute, a think tank here. ?In termsof any kind of direct missile threat [to the United States], it?s likely to bemany years before they could have that capability. The people worrying more areothers in the Middle East and Europe.? Carpentersaid perhaps even more unsettling than the Iranian satellite launch are recentmedia reports that North Korea is again preparing to launch its three-stageTaepodong-2 missile, which some believe will have the range to reach U.S.territory. North Korea tested one of thesemissiles in 2006, but it failed shortly after launch and broke apart in theair. ?NorthKorea poses a much more direct threat to the United States because if it istrue North Korea is planning to test an advanced version of the Taepodong-2,that could put Alaska and the U.S. west coast in range,? Carpenter said. ThomasDonnelly, a defense and security policy analyst at the American EnterpriseInstitute, said the United States and Europe ought to be concerned about theprogression of Iranian technology. He argued that Iran is more of a threat tothe United States than North Korea, based on Tehran?s backing of insurgents inIraq. ?That hasbeen a capability we have seen Iran developing, but the fact that it now hasactually happened is a jarring punctuation mark,? Donnelly said. ?Given what webelieve about their nuclear program, it seems pretty clear they?re very closeto having a complete, deliverable weapon that would have the ability to reachout to Europe.? MichaelO?Hanlon, a senior fellow at the Brookings Institution here, said though theIranian satellite launch may not show an increase in the physical range ofIranian weapon systems, it is perhaps a more impressive display oftechnological prowess than a missile test launch would have been. ?Thatsuggests a certain amount of control and guidance mastery,? O?Hanlon said. ?You?ve got to hit a fairly narrow band to put something in orbit, and thesimple act of firing a missile doesn?t tell you anything about how close themissile landed to its target. ?Itdemonstrates more sophistication than I would have assumed, but I am notsurprised they did this. ?